It’s 1931. 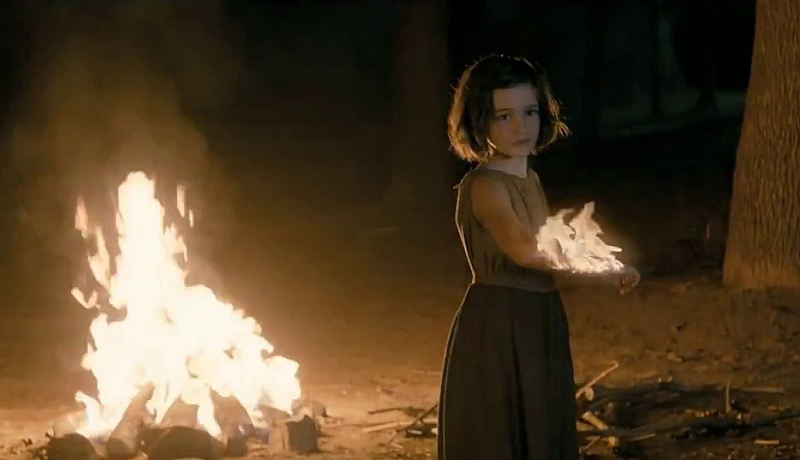 A girl finds her younger sister playing with fire, quite literally: the child’s arm is on fire, but she is quite calm, telling her sister that it doesn’t hurt at all. In order to share the game, she pours lamp oil over her older sister’s head and lights it with the flames on her arm. To the young girl’s horror, her sister begins screaming in agony as she is consumed by the fire. A young boy is found with abrasions all over his body; like the girl, he felt no pain as he chewed and ate parts of his own flesh. The authorities decide the best course of action is to have these children – and several others like them – incarcerated in a lunatic asylum, where they are strapped into straitjackets (with a muzzle for the boy described above) and left in padded cells where they can do no harm to themselves or anyone else. In the present day, a doctor survives a car crash that kills his pregnant wife, although their premature baby is alive, with a slim chance of survival. When a scan is performed on the doctor’s body after the accident, it reveals that he has lymphatic cancer, and only a few months to live. In need of a bone marrow transplant, he goes to see his estranged parents, where there are revelations in store. This synopsis only covers the first 30 minutes, so I haven’t given much away. On a technical level, Painless is exemplary. First-rate cinematography and art direction give a yellow, musty and retro feel to the scenes in the 1930s, while most of the present day scenes possess an angular, modern and sterile look. Symbols of modernity abound in the latter thread, characterized by sleek new cars, computers and scientific equipment that are at odds with the old-fashioned medic equipment that resembles medieval instruments of torture. The high-quality technical elements are matched by superior acting, particularly from Paul Verhoeven regular Derek de Lint, as a scientist determined to understand and treat the children’s condition, and Àlex Brendemühl as the dying doctor of the modern era. However, Painless is not easy viewing. Director Juan Carlos Medina subjects his characters to every kind of indignity, misfortune or brutality, whether it is deliberate, unintentional or arises from an unfortunate twist of fate. The children inflict horrible wounds on themselves, only to be thrown into padded cells and brutalized by the staff, who treat their condition like a child’s bad behaviour rather than a medical condition. The doctor loses his wife (and possibly his son, who might not survive), develops cancer and then discovers another painful secret that may be a significant factor in his approaching demise. Even the kindly scientist has been forced to flee from the Nazis because he’s Jewish. Examples of human kindness are few and far between, and most of those can do little to stop the tide of misery and cruelty depicted by the film. For that reason it’s not an easy film to recommend, although it’s an interesting take on the legacy of the Spanish Civil War.